Special Note: Organic gardening guru Mike McGrath has moved his Public Radio show You Bet Your Garden from Philadelphia to WLVT in Bethlehem, PA, where 'locals' (the Lehigh Valley, greater Philadelphia area, South Jersey and Delaware) can watch the show on TV every Saturday morning at 10 am—including the famed Gardens Alive Question of the Week! The podcast and online stream can be accessed at www.wlvt.org; and local affiliates around the country can pick up each week's show as usual. (If your affiliate is having trouble accessing the show, please have them email Mike's staff at YBYG@ptd.net.) 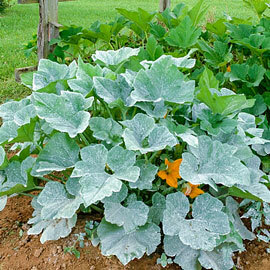 And please call in with YOUR garden questions at 833-727-9588; we'll try and arrange for you to be a caller on the show! Q. Anneke (which she says is pronounced like "un ick a unicka") in Lake Leelanau, Michigan writes: "I have had an attack of 'rose schafers'—am I spelling that right? Anyway, they devastated my rose bushes this year: no matter how fast I picked the little guys off, more came flying in. They attacked other plants as well; in fact, a few are still hanging onto my beans! What can I spray instead of Seven?" A. You were close; the insect's name is 'rose chafer'—not Schafer, which was the name of a childhood friend of mine (but I never saw Bobby Schafer attack a rose). Now—before we move onto your pest, I'll note one other misspelling in your email that is common in garden communication: You wrote 'Seven', as in the number seven; the actual name of this incredibly toxic insecticide is S EV I N.
I make a point of this because many gardeners have written to say that they were told that "Sevin" was a combination of seven natural ingredients. Nothing could be further than the truth. The National Pesticide Information Center (a cooperative agreement between the EPA and Oregon State University) reports that Carbaryl—the active ingredient in Sevin—has been evaluated by the EPA as "likely to cause cancer". It is also highly toxic to bees and earthworms. And birds exposed to low doses laid fewer eggs; and then there were fewer healthy babies from eggs that did hatch. Nasty stuff. Thank you for seeking an alternative. You'll only see the Australian chafer in Australia. It's extremely colorful, with a green, yellow and brown design that looks like a violin—hence its common name of 'Fiddler beetle'. The European chafer—also called the 'green rose chafer' and just plain 'rose chafer' is a dazzlingly bright metallic green. You'll find it in the UK and Southern and Central Europe. The least attractive member of the family is the North American chafer: a kind of a dirty-tan, yellowish color with yellow hairs, that, as with many humans, fall off with age. (Ahem.) They are also the most destructive of the group. Like their shiny green and copper-colored cousin, the Japanese beetle, the North American chafer tends to feed in swarms, eating the inside parts of leaves while avoiding the veins, thus giving the plants a classic 'skeletonized', lacy appearance. Like Japanese beetles, the first ones to feed give off a pheromone that attracts more beetles, setting off a feeding frenzy that can rapidly defoliate plants. Again, just like Japanese beetles, their immature, larval grub form is also destructive. While Japanese beetle grubs stick to eating the roots of lawn grasses in the late summer and fall, North American chafer grubs also feed on the roots of ornamental plants. Oh; if your roses are getting eaten at night, and the damage isn't lacy, the culprit might be another scarab—the nocturnal Asiatic beetle. May and June beetles are also members of the scarab family that attack plants in the United States. Luckily, control is the same for all of the scarabs. 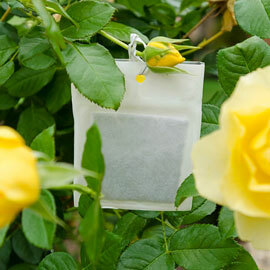 First, put out a single Japanese beetle trap near your smelliest roses in late spring and check it every day. As soon as you catch the first beetle, take the trap down, seal it in plastic and hide it the basement. Like professional growers, you're only using the trap for monitoring and early detection, not control. Once you catch that first beetle, you know the swarm is coming and it's time to take action. The key here to kill off the first wave of beetles rapidly so their swarming instinct won't kick in. 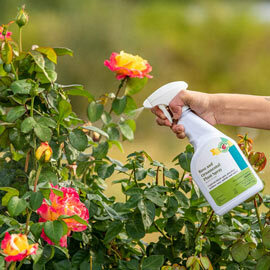 After a month or so, you can relax the spraying, as the rest of the beetles in your area will be busy eating other people's roses. This new form of Bt also comes in a granular form that kills grubs underground. 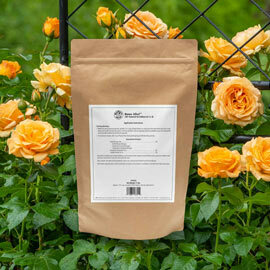 Apply this version of BTG to lawns in early August—as soon as most of the adults have vanished—and you'll take out any grubs that survived your above ground attack. You can also apply beneficial nematodes to the soil in late summer; these microscopic predators will seek out and destroy your grubs. Nematodes are also effective in the spring, but the soil has to be nice and warm for them to easily move around and grub hunt. And finally, an old canister vacuum is a great solution for rogue beetles on unsprayed plants; be sure to taunt them as they go down the tube!